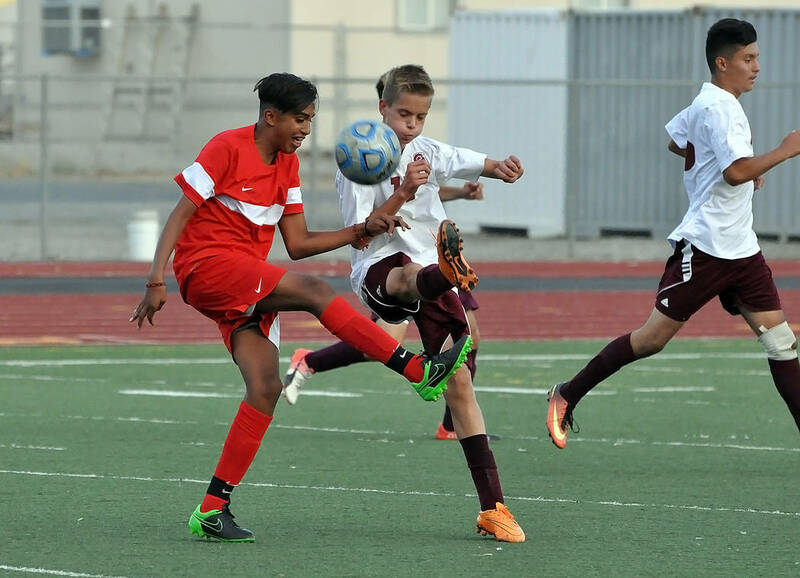 The Western Warriors were just too much for the Pahrump Valley boys soccer team on Monday evening as the Trojans fell at home 8-0. Horace Langford Jr./Pahrump Valley Times Trojans junior soccer player Eric Toomer tries to get control of the ball against Western on Monday night. The Trojans had problems controlling the ball the entire game. Horace Langford Jr./Pahrump Valley Times Trojans junior player Jose Chavez fights for the ball against Western on Monday night. 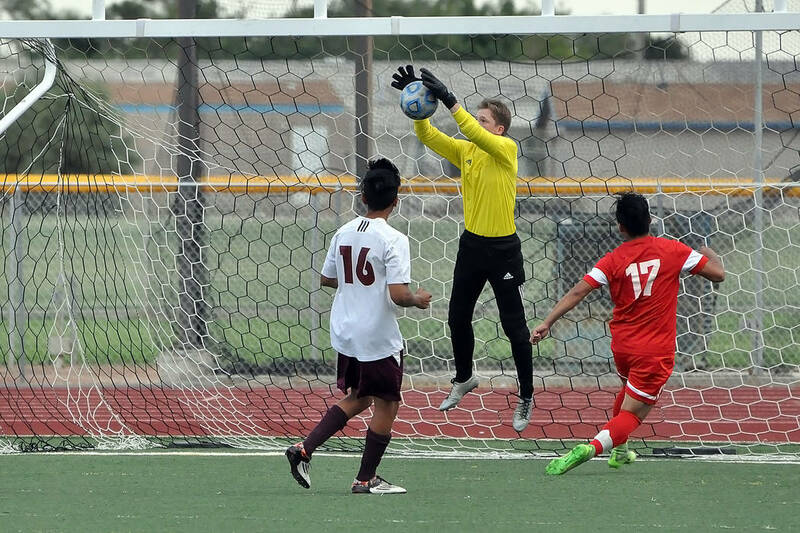 Western dominated the boys soccer game on Monday. Horace Langford Jr./Pahrump Valley Times Pahrump Valley’s goalkeeper, sophomore Ian Kingsley, was kept busy all night as the Warriors scored eight goals. The game was called due to the mercy rule late in the second half with 9:14 remaining in the game. The Warriors (7-0-2 overall, 2-0 Sunset League) showed the Trojans (1-8-1, 0-2) why they were the runner-up at state last year and why they have been Sunset League champs for the past four years as they scored frequently and at will with near-perfect passing and ball handling. They kept the ball on the Trojans side of the field the entire game. The first score came with 27 minutes to go in the first half as Juan Alvarez passed to Juan Estrada, who kicked it into the net. Estrada scored two more times in the first half. Alvarez and Henry Ceballos scored the other two goals in the first half to make the score 5-0 at the half. 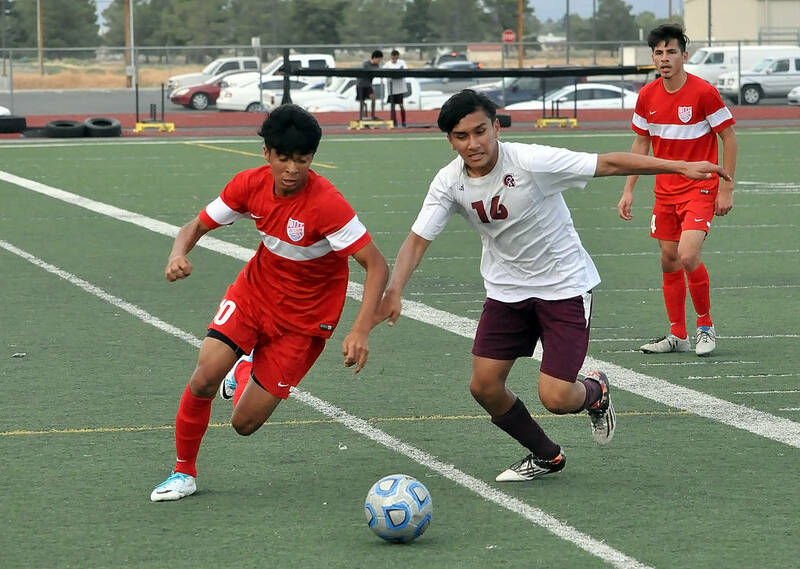 Pahrump Valley couldn’t find any answers to the Warriors scoring during their break as Western scored three more goals to end the game. The goals were scored by Elizandro Zaragoza, Bryan Jimenez and Andy Rodriquez. In his fifth year at Western and second year as head coach, Kory Pippin demands a lot from his team. Pippin said his team is young but still has experience. The Trojans host Boulder City at 11:30 a.m. on Saturday for their next home game. Trojans girls soccer (7-2-2, 1-0-1) battled Western (2-2-2, 1-0-1) to a 1-1 tie in league play on Monday on the road.